Best corrected visual acuity equal to or less than 0.1 (1/10 on the Wecker scale). Visual field of 10 degrees or less. Membership means becoming a part of the Institution, assuming the rights and responsibilities listed in its Statutes. It also means having access to all of the specialized social services (rehabilitation, educational assistance, employment, cultural activities, etc.) and the possibility of working as a Cupón sales agent or in any other job within the Organization for which the individual is qualified. Every year the Organization welcomes nearly 4,000 new members. Currently, 20.78% of our members are completely blind, while 79.22% have a serious visual impairment. Eliminating preventable blindness around the world by 2020 is the goal of the global “2020 Vision” campaign. 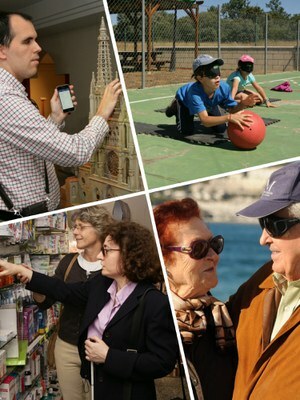 The World Health Organization (WHO) and the International Agency for the Prevention of Blindness, in concert with a coalition of interested organizations like the ONCE, are promoting activities and workshops to shine a spotlight on blindness, visual impairment and the rehabilitation of people with serious visual problems. According to the WHO, “between one and two million new cases of blindness are detected every year, despite 80% of them being preventable and treatable”. Adequate prevention would mitigate many of the eye-related problems that plague the planet’s most disadvantaged countries. There are about 161 million visually disabled people in the world, of whom 40 million are completely blind. In addition to the cooperation between the ONCE and national and international organizations to fight preventable blindness, the ONCE is also financing university research projects on issues involving ophthalmic pathologies. And, always on the lookout for new scientific advances, the ONCE provides a Genetic Screening service for those members with a hereditary or congenital visual pathology. The ONCE offers a wide range of assistance programs and benefits to ensure the social well-being of its members. The Organization is involved in different programs intended to improve well-being, such as providing essential needs in the home or the tele-assistance service to meet the needs of those blind persons living alone. The ONCE, concerned about its seniors and retirees, organizes “Social Vacations” every year, and “Summer Camps” for the little ones. Free time, leisure activities and enjoying nature are essential aspects of modern society, and as such can have positive effects on the integration of persons with visual impairments. The Organization promotes a volunteer plan at all of its centers. The ONCE Volunteer Service has five activity programs: accompaniment, access to information, cultural/recreational, sports and professional experience (which consists of using another member’s professional background to facilitate another interested member’s access to a job program). Each year hundreds of people of every age selflessly volunteer to offer various services. On average, some 17,000 such services are performed every year by over 1,300 volunteers.